Canvas Tier 1 support is available 24x7, 365 days a year. There are multiple ways to get support for Canvas-related issues or questions. Call the FAU helpdesk at 561.297.3999 and choose Option 3. If you are logged into Canvas (https://canvas.fau.edu), click on the Help icon at the bottom left corner, under the global menu. 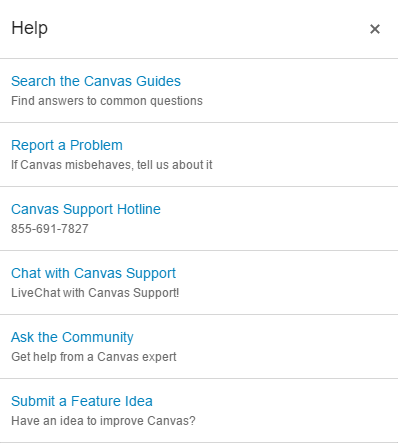 You will be able to chat with a canvass representative by clicking on “Chat with Canvas Support” or you can choose to “Report a Problem,” which will submit a ticket to Canvas Support. You can also search the Canvas guides by visiting guides.canvaslms.com or visit the Canvas Community and ask a question. If you are looking to learn more about FAU’s transition from Blackboard to Canvas, please visit fau.edu/canvas or attend one of our Canvas workshops visit techevents.fau.edu to view the training schedule and to register. If your questions cannot be answered using Canvas Help, please submit a ticket using the “Submit a Ticket” button on the right. Check out this service request I found in the Florida Atlantic University service catalog. https://helpdesk.fau.edu/TDClient/Requests/ServiceDet?ID=14674 Canvas Help Learn how to reach Canvas support or request additional help from Instructional Technologies staff.